These are my completed DIY projects. 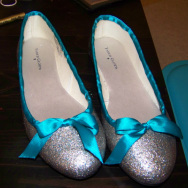 I used the link below for the glitter part. I added a ribbon trim with hot glue. I will finish the bows later. 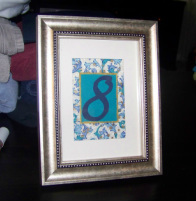 I got another great deal on a frame (8 1/2x11), this time at Jo-Anns. I trimmed a piece of scrapbook paper to fit in the frame- I like the paper with the canvas finish. 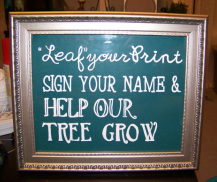 I printed the message on a sheet of paper, placed it in the frame, then traced over it with a white Sharpie paint pen. It didn't come out very easy to read, so I went over it again with acrylic paint and a fine brush. I had my poster printed a while back, but I just got a great deal on a frame from Michael's (40% off all frames, then an additional 15% off! ), so I decided to go ahead and frame it to flatten the poster since it has been stored rolled up. I got the downloadable file for the tree at the link below, added our names and date on the Vistaprint website, and had it printed as a medium poster. 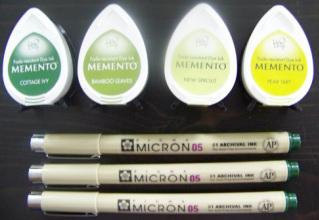 I also picked up the stamp pads and pens to go with it. 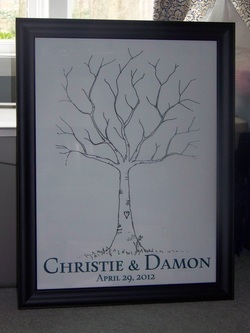 During the wedding, the poster will be laid out on its own on a table and the frame will hold the seating chart, which I will also have printed as a VP poster. I really wish I had a better pic of these, you can't really tell that there is a metallic shimmer to the papers, but they look great close-up. I made two of these towers plus an extra 1-tier stand in case we need the extra space. The paper was all on sale at Jo-Ann's plus I had a 20% off total purchase coupon. 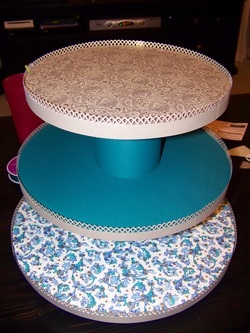 I also used the coupon to get multi-packs of cardboard cake circles, in 10", 12", and 14". I used the directions from the link below, but used larger circles to accommodate the amount of cupcakes that we will have, and used three circles per layer, instead of two, for added strength. Instead of ribbon trim, I used paper with a decorative border punched and hot-glued it around the edges. I will use the paper scraps to make picks to mark the cake flavors for a display with a cloche jar. Total cost- around $25. for all towers, with extra materials leftover. 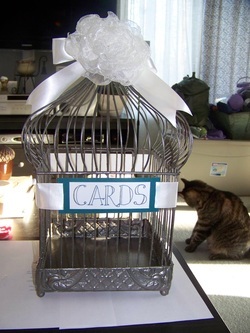 I have been searching for the perfect birdcage for awhile now and couldn't find any that had large enough openings to fit larger greeting cards that didn't cost $90. I finally found this one at Hobby Lobby last week, on clearance for $25. I repainted it using Krylon Shortcuts in Antique Bronze- 1 can was more than enough for several coats. I used ribbon and cardstock that I had left over from some other DIY's for the accents. I made the flower out of organza (bought with a 40% off coupon!) using the tutorial from the link below. I LOVE the way it turned out! I started off with a pillow made from two 8x8 fabric squares. The 1 1/2" ribbon is stitched on and the cinch in the middle is held in place by one of the same pearl beads used to finish the flowers. The flowers for the headbands are mounted on a fabric strip that is hot glued around the band. These were SUPER easy to make and ended up being pretty inexpensive at around $8 total for the pillow and two headbands (use your coupons, folks! Most chain craft stores accept competitor's coupons!). I cut fabric strips from the leftover fabric of the pillow. For the headbands, the strips were approximately 2x24", and for the pillow, I used a 3' width for a larger flower (In hindsight, I would have used a longer strip for the larger flower to keep it proportionately full). You can skip this step if you prefer a raw, frayed edge- I didn't. I applied Stop Fraying to ONE long side of each strip; it isn't necessary to do both because the other edge won't show at the end. Another upside of using the SF is that it will help the fabric hold its shape and is somewhat moldable. After it dries, just trim away a very narrow strip so you are left with a nice clean edge, being careful not to cut beyond where you applied the SF. Don't worry about the smear, this will be the underside and it won't show through. I wanted to tie in the gold that will be used throughout our decor so I painted on a thin accent of gold on the same edge as the Stop Fraying, but the reverse side. Again, this was personal preference and not necessary, I just felt it gave it a "pop". Next, on the opposite edge, do a quick running stitch the length of your strip. Don't worry if you aren't an expert seamstress, this is super easy and your stitches don't have to be perfect because they won't be visible on the finished flower. Every couple of inches, gather the thread so that it cinches the strip. Tie the thread off at the end and you should have what looks like a ruffle on steroids. Start working the ruffle around in a tight circle, until you get to the end of the strip. I worked each flower through, before I went back and hot-glued each layer in the center, so that I had the shape roughly formed before I attached it. If you want, use a drop of hot glue in the center of the flower for a bead, to give it a finished look. These were pretty easy to create. Using the same paper that we used for our belly bands, I cut a small rectangle as the backing. I cut a 2x3 square out of a coordinating cardstock and handpainted the gold trim. I printed the series of numbers in the font and size I wanted and just cut it out of the cobalt cardstock and glued it to the smaller square. Popped it all into the frames ($3/each, Walmart), using the provided matte. I used Armour Etch to do these votives for the members of my bridal party. 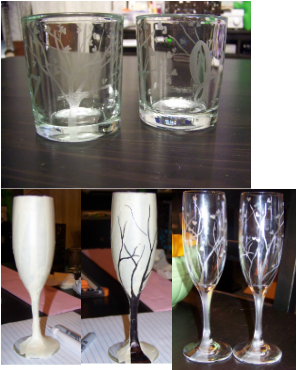 Each glass is monogrammed for each girl and has the same tree design. I washed each glass, then wrapped it completely in masking tape. I drew the design onto the tape and cut it out using a craft knife. You wouldn't normally need to wrap the whole glass except my design wraps all the way around. I used the same process for the toasting flutes. In the first picture, you see the wrapped glass. In the second, the tree pattern has been drawn on, I freehand the heart leaves as I cut the design out. The last is the finished product. This was inspired by a Knot photo. 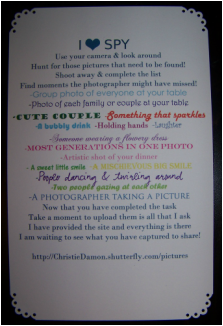 I created the text in Photoshop and printed with Vistaprint on the flat invitation, double-sided. I used a decorative corner punch for the trim. One will be placed on each table in a small stand. 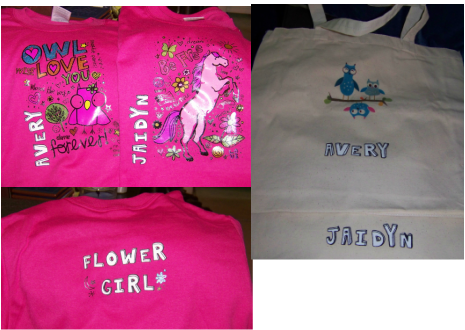 I did these for about $20 total using iron-on kits from JoAnn's. Super easy to do, plus I love that this is something they can get some wear out of. The image on the tote bags is one from the Vistaprint library and I added the names. Lovelovelove how these turned out! I bought the paper mache letters from Jo-Ann's and Mod Podged scrapbook paper to the fronts and edges. Another super-easy project.